Michael Raffl the Key to Giroux's Resurgence? 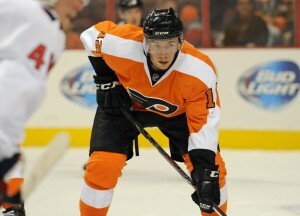 Michael Raffl the Key to Giroux’s Resurgence? One has two 30 goal seasons to his name in the NHL. The other has one near-PPG season in HockeyAllsvenskan, the second tier hockey league in Sweden whose competition level is comparable to the ECHL. It would seem like a no brainer that the NHL veteran would be the better option. But for Claude Giroux and Jakub Voracek, it’s not so simple. Since Scott Hartnell was demoted from the first line and replaced with Michael Raffl, Giroux and Voracek have caught fire. The new line was formed after the Flyers were embarrassed by the Chicago Blackhawks. In Giroux’s first 31 games of the season, he had six multi-point games. In the four games the Raffl-Giroux-Voracek line has been intact, he already has three. Giroux has 9 points in those 4 games, and Voracek has 8. Before the line was formed, you have to go back 11 games for Giroux, and 15 games for Voracek to match those totals. Giroux set a career high in points alongside Hartnell and Jaromir Jagr in 2011-12, and Voracek set career highs on a line with Giroux and Hartnell in 2012-13. So why was the line a failure this year? Now in his 7th season for the Flyers, we know what to expect from Scott Hartnell. He will drive the net, battle in the corners and in the crease, agitate, and hit. His strength is his combination of physicality and goal scoring ability. By far his biggest weakness is his skating ability. He even formed a charity around how often he falls down on the ice. Now that he’s on the other side of 30, his skating certainly won’t get any better. Michael Raffl, on the other hand, does not possess the power game that Hartnell has. Instead, Raffl relies on his strong skating ability and hockey sense to make plays. He has straight-line speed that Hartnell simply doesn’t have. When the Flyers signed him this offseason, they lauded his combination of versatility, skating, and skill. They also saw “bite” and competitiveness in his game. Raffl’s downside is that he does not possess top-end skill. Raffl has allowed Voracek and Giroux to unlock their scoring potential because he has the speed to keep up with them in transition. His skating ability allows them to fully utilize their slick stickhandling and skating skills. Hartnell would often lag behind Giroux and Voracek entering the offensive zone, leaving the two outnumbered and unable to stickhandle themselves out of trouble. Add in the fact that the Flyers’ transition game is already lacking due to a slow defensive corps, the two most electric Flyers forwards simply could not afford to have another player slowing them down. Now that they’ve got another option to pass to that skates with them, the offense has come. It’s not as if Raffl has provided dynamic offensive ability; he has 5 assists in the 4 games that they’ve been together. Most of that is a result of him using his speed and intelligence to get the puck out of the corner, and onto the sticks of his more talented teammates. Hartnell creates space with his body, and Michael Raffl creates it with his speed. How Did Hartnell Work With Giroux Before? When Giroux was on a line with Hartnell and Jagr in 2011-12, both Hartnell and Giroux set career highs in goals and points. The key difference that allowed that line to succeed, and the 13–14 experiment to fail was the third linemate. Jaromir Jagr possesses sublime vision, patience, and hockey IQ when he has the puck on his stick. Although his skating was a shell of what it used to be, his hands and passing ability allowed the line to play an elite possession game. Jagr had the elite hockey IQ necessary to finish off Giroux’s passes, making up for the fact that Giroux was playing alongside two relatively slow linemates. Hartnell had a career year because the line was playing at his speed, and he could pick up the garbage. The team also had the perennially underrated Matt Carle, and a younger Kimmo Timonen breaking the puck out better at even strength. In 2012-13, Voracek had a career year alongside Giroux, and mostly Hartnell. So if the line this year was exactly the same as last year, why did they fail this year? The answer lies in the ineffectiveness of the Philadelphia power play this year. Last year, Giroux scored 7.09 points per 60 minutes on the power play, and Voracek had 6.08. This year, those numbers are down to 6.02 for Giroux, and 3.62 for Voracek. Both rely significantly on the power play to score their points, and this year the power play hasn’t clicked to mask their even strength deficiencies. Last year, the line never really got on track at even strength because Hartnell was slowed by a broken foot, and when he came back, his already below average skating suffered further. Hartnell struggled mightily, putting up just 11 points in 32 games while the other two managed to create offense by themselves. With the way they are clicking right now, there is no way Craig Berube will break up the speedy first line. Although their offense has cooled down a bit, the third line of Steve Downie, Sean Couturier, and Matt Read has remained very effective in both ends of the ice. The second line of Schenn, Simmonds, and Hartnell has been ineffective, no surprise considering the lack of footspeed between Simmonds and Hartnell. They have speed similar to the Hartnell-Giroux-Jagr line, but nowhere near the same skill. Vinny Lecavalier said it was possible he could return by December 28th. When he does, he will claim his spot on the second line. This means that one of Hartnell or Simmonds will likely find themselves on the fourth line.